Here we go. 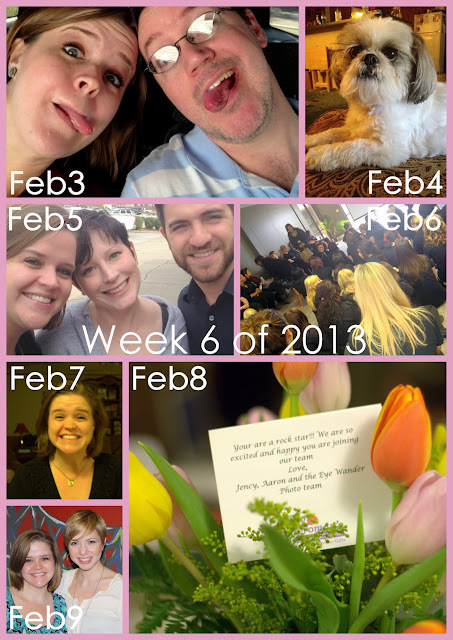 My 6th week of 2013! Sun, Feb 3. Sometimes you have nothing to do but make silly faces to get a pic-of-the-day. Good morning at church, though. Wed, Feb 6. Just another day at work! This is our "grand assembly" - a once a month meeting with our students! Thurs, Feb 7. I was really happy today, in case you can't tell! Pretty much smiled like this all day! I found out that this new job situation would work out, and i knew that i would be giving 2 weeks notice at my current job the following day! And yes... i was very happy about that! Fri, Feb 8. I gave my two weeks notice & it went well. Then i received FLOWERS from my new boss, his wife & their company. Y'ALL! FLOWERS to welcome me! How thoughtful is that! ?